Vary terms in a legal contract. Using this document, you can insert, delete and amend words, paragraphs and clauses or renumber existing paragraphs. 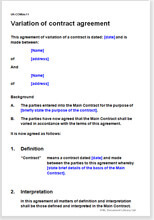 This is an easy to use document that can be used to make changes to any contract. Using this agreement, you can add, delete or change words or entire sections. We recommend using an agreement such as this one to change terms rather than agreeing the new terms verbally as having the agreement in writing provides a record of your agreed position should any dispute arise later. Commonly, this agreement would be used where there has been an unforeseen change in circumstances (such as increases in the price of raw materials), or in purpose or objective of the contract.